Year-to-date emerging market equities have rallied 24%, twice as fast as the Dow Jones (12%) which has rallied twice as fast as EM currencies versus the Dollar (6%). 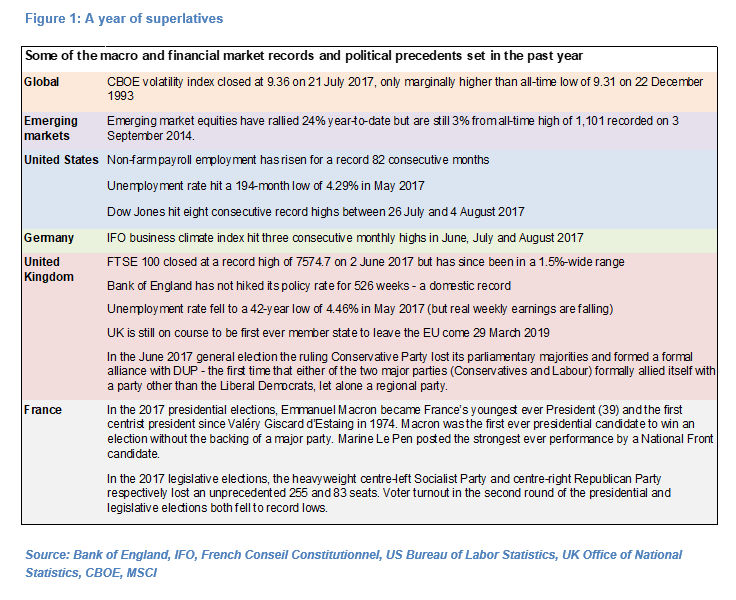 The past year has been remarkable in many ways with political precedents set in the US, UK and France, still record-low central bank policy rates in most developed economies and financial markets and macro data at all-time or multi-year highs and lows (see Figure 1). 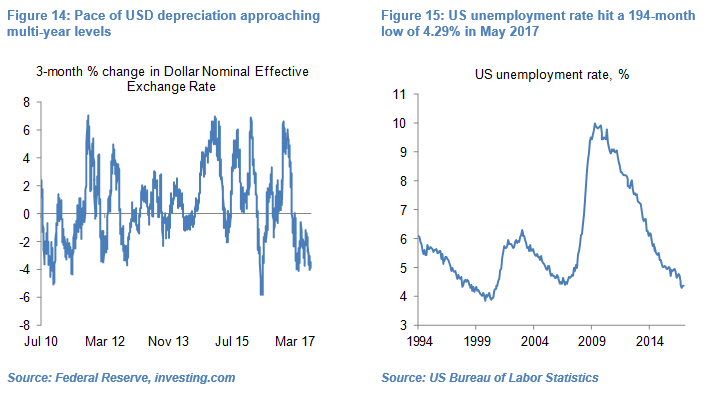 The US and UK have displayed many similar characteristics in the past 18 months, including record highs in domestic equity indices, significant currency depreciation, multi-year lows in the unemployment rate and weak (US) or negative (UK) real wage growth – similarities which I would argue stem in part from the Federal Reserve and Bank of England (BoE) having cut their policy rates and particularly started quantitative easing programs before most major central banks, including the European Central Bank (ECB). Financial markets’ reaction functions to the political precedents set in the US, UK and France since mid-2016 have been very different. In the US, financial markets and the economy have seemingly glossed over the political cracks in Donald Trump’s presidency. In the UK, the political landscape has changed immeasurably since June-2016 but arguably for the worst, with Theresa May’s government facing many pressing and complex challenges. In France, presidential and legislative elections in April-June 2017 have provided a unique opportunity for President Macron and his centrist government to undertake much needed structural reforms and helped propel the Euro stronger. In the US, the victory of Donald Trump in the November 2016 presidential elections was unique in many ways, not least because he became the first president since Herbert Hoover (1929-1933) with no political or military experience. US financial markets gave President Trump the benefit of the doubt and have for now seemingly ignored the chaos within his administration and the failure to make any progress on key electoral promises, including the repeal of Obamacare and in particular infrastructural spending and tax cuts. The British electorate voted in the 23rd June referendum in favour of leaving the EU and the UK is still on course to be the first ever member state to leave the EU come 29th March 2019 – arguably the most complex political, economic, financial, legal and social undertaking ever by an EU member state. Prime Minister Cameron, who triggered the referendum, arguably had not prepared for the eventuality of a leave vote and his successor, Theresa May, has since been playing catch up. It is still not obvious that her cabinet has a viable and detailed plan for the UK leaving the EU, with time running out (see UK: Land of hope & glory…but mostly confusion, 7 July 2017). Moreover, in the 8th of June general election the ruling Conservative Party lost its absolute and working majorities and was forced into a formal alliance with Northern-Irish Democratic Unionist Party (see UK election: Clutching defeat from the jaws of victory, 9 June 2017). This is the first time that either of the two major parties (Conservatives and Labour) has signed a formal alliance with a party other than the Liberal Democrats, let alone a regional party. The Conservative-DUP alliance has only a slim working majority of 13 seats in the House of Commons which may stymie its ability to successfully pass legislation, including pertaining to Brexit. The terms and conditions of the UK’s divorce and of a new deal with the EU remain vague at best and a breakdown in negotiations could still potentially derail the UK’s planned exit from the EU. Murmurs of a second referendum on EU membership have grown a little louder but the government will try to avoid this scenario at all cost, in my view. Polls suggest that if another referendum were held today, the Remain vote’s margin of victory would be statistically insignificant and the electorate would likely baulk at the idea of yet another major vote (the UK has held two general elections and a referendum in the past two years). So barring an incredible and arguably embarrassing U-turn, the UK’s membership of the EU will cease in 598 days (46 years after it joined the European Economic Community, the EU’s predecessor)…at least on paper. In practice, the UK may retain many of the benefits and costs of EU membership for at least another couple of years as cabinet members have in recent weeks been increasingly united in their view that a transitional agreement could be in place at least until the next general elections in 2022. This ties with my view, first expressed in early June that, with a full-scale and permanent deal with the EU unlikely to be in place by end-2018, the government would have only two real options: walking away from a deal and reverting back to WTO trading rules or more likely agreeing to a transitional deal which buys it more time to contemplate its options. The latter could include some form of borderless trade with the EU for a defined period in exchange for continued contributions to the EU budget and a watered down version of the EU-immigration targets the government currently has in mind (see UK Election Special – When two tribes go to war, 2 June 2017). The outcome of the two-round French presidential and legislative elections in April-May and June were unparalleled. They set a number of records and precedents, in the process challenging many long-held assumptions and significantly altering France’s political landscape (see H2 2017: Something old, something new, something revisited, 23 June 2017). However, there are signs that President Macron’s honeymoon with the French electorate is well and truly over as political and fiscal realities start to bite. Delays and/or a watering down of Macron’s fiscal promises, including a pruning of the state sector, are unlikely to single-handedly halt the Euro’s continued climb but could at the margin cloud the currently positive Eurozone macro picture. 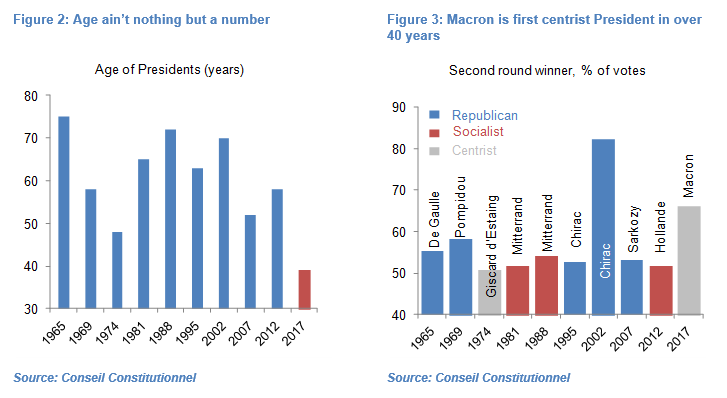 At 39 years old, Emmanuel Macron became France’s youngest ever President (see Figure 2) and the first centrist president since Valéry Giscard d’Estaing who won the 1974 elections as the Union for French Democracy’s candidate (see Figure 3). Perhaps more significantly, Macron was the first ever presidential candidate to win an election without the backing of a major party, having launched his En Marche! movement in April 2016. While Marine Le Pen fell well short in the second round of being elected president, it was by far the ever strongest performance by a National Front candidate. But the presidential election also revealed the extent to which voters were both divided across the political spectrum and apathetic. Four candidates won 19% or more of the popular vote in the first round of voting on 23rd April – which was unheard of – and in the second round a record high 34% of registered voters failed to vote or returned blank/void ballot papers. The legislative elections were just as remarkable, with Macron’s La République en Marche (LREM) party winning 308 seats in the 577-seat National Assembly – a 19-seat absolute majority. In the process, LREM crushed the heavyweight centre-left Socialist Party and centre-right Republican Party which respectively lost a barely-believable 255 and 83 seats – by far their worst performances under the Fifth Republic. But again voter turnout was the lowest ever with only 38.4% of registered voters in the second round casting a valid vote and only 16.5% voting for the LREM. Macron’s vision and the paucity of the opposition got him and LREM comfortably over the finish line, but tepid popular support remains to this day an important variable. According to a You Gov poll, Macron’s popularity was 36% in early August, down 7 percentage points (pp) from a month ago and below that of his Prime Minister Edouard Philippe (37%). Among Macron’s party supporters, a still remarkable 81% said they held a favourable opinion of the president but this was down 14pp. Macron and his government have moved fast to push through tax reforms (including on wealth and property) and are due to present draft labour-law reforms on 31 August. However, a fiscal deficit which the independent Court des Comptes forecasts at 3.2% of GDP in 2017 is constraining the timing and ambitiousness of these draft measures with the government committed to cutting the deficit-to-GDP ratio, which hit 3.4% in 2016, below the EU-sanctioned threshold of 3%. 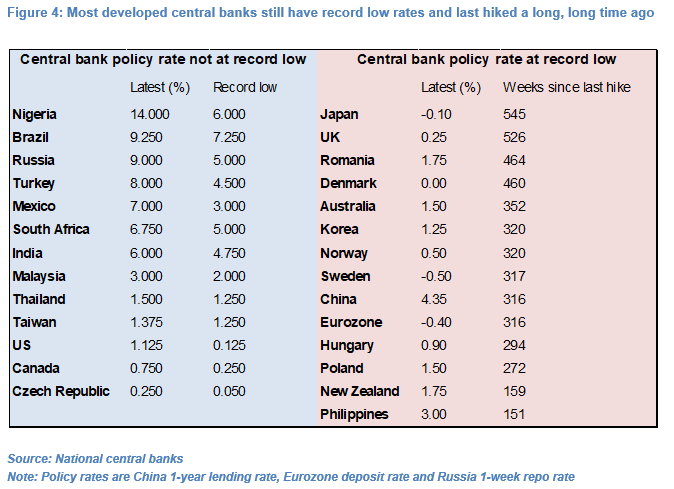 Central bank policy rates remain at record lows in the majority of developed economies, including the Eurozone, UK, Japan, Australia and New Zealand (see Figure 4) and I expect this to remain the case for the remainder of the year. Loose global monetary policy is likely to continue providing a floor to risky assets, including equities and emerging market currencies. A number of central banks have hiked 25bp in recent months, including the US Federal Reserve in June, Bank of Canada in July and Czech National Bank in August, in line with my year-old view that rate hikes would gradually replace rate cuts (see Global central bank easing nearing important inflexion point, 16 September 2016). But in aggregate the turnaround in developed central bank monetary policy is proceeding at a glacial pace (see Figure 5) and I see few reasons why this should change (see Central banks – A muted second inflexion point, 14 July 2017). Overall, financial markets are at present pricing in only very modest developed central bank rate hikes for the remainder of the year and this seems broadly appropriate. For the US, my core scenario remains that the Federal Reserve will not hike again this year, but this is admittedly a modest conviction call – decent US macro data, the inflationary impact of the Dollar’s depreciation (see Figure 10) and a core group of still hawkish FOMC members may be sufficient to deliver a 25bp hike at the December policy meeting. The rates market is still sitting on the fence, pricing in 11bp of hikes before end-year (and 22.5bp in 2018). Markets are only pricing in 5bp of hikes for the Reserve Bank of Australia for the remainder of the year and 17.5bp for the next 12 months, which seems apt as the RBA has given every indication that it is comfortable with the current policy rate. The Bank of England’s record low policy rate of 0.25% has now been in place for a year. The BoE has not hiked rates for 526 weeks – a domestic record (see Figure 4) – and I continue to believe that this stretch will extend into 2018 (see H2 2017: Something old, something new, something revisited, 23 June 2017). Financial markets are pricing 6bp of hikes for the rest of the year and while this pricing may occasionally rise I would expect it to continue trending lower in coming months and keep Sterling on the back foot. At its latest policy meeting on 3rd August, the BoE Monetary Policy Council (MPC) kept rates unchanged and lowered its GDP growth forecast for 2017 to 1.7% from 1.9% in line with my expectations (see No UK rate hikes this year and room for further Euro upside, 28 July 2017). While the tone of the MPC’s accompanying statement was broadly neutral in my view, MPC member Andrew Haldane – who had in recent weeks signalled his support for a rate hike – did not join Michael Saunders and Ian McCafferty in voting for a 25bp hike at this week’s meeting. Moreover, while the BoE’s latest MPC statement foresees year-on-year CPI-inflation, which fell to 2.6% in June from 2.9% in May, peaking at 3.0% in October, my analysis suggests that – barring a further Sterling collapse – CPI-inflation may fail to reach 3% and in any case will trend lower in the next six months. 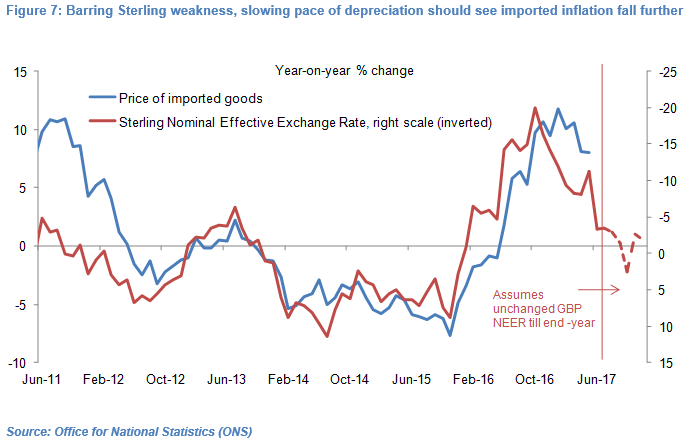 For starters, the pace of year-on-year depreciation in Sterling is fading (as a result of base effects), which based on precedent should translate into lower imported prices (see Figure 7) and in turn, albeit with a lag, into lower headline and core CPI-inflation (see Figure 8). 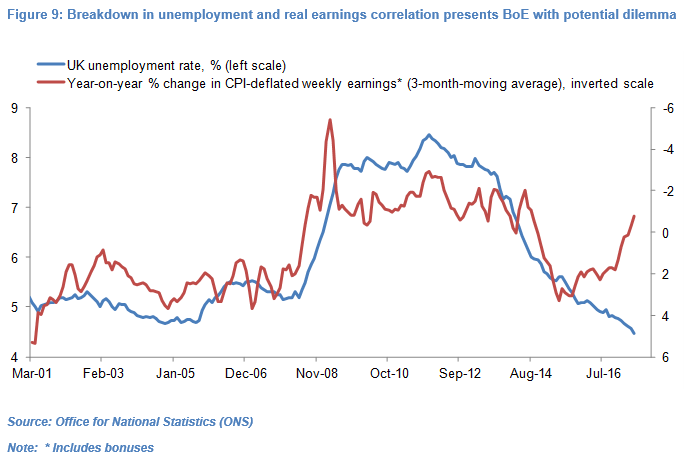 Finally, despite the apparent strength of the UK labour market, there is little evidence of wage-led inflation. Figure 9 shows that the historical inverse correlation between the unemployment rate and real weekly earnings growth broke down in the fall of 2015. So despite the unemployment rate falling from 5.3% in September 2015 to a 42-year low of 4.46% in May 2017, year-on-year growth in real weekly earnings slowed from about 2.7% in Q3 2015 to -0.7% in the three months to May 2017. Existing and new workers have been unable to negotiate increases in nominal earnings to match or exceed the rise in CPI-inflation. On the surface this presents the BoE with a potential dilemma. 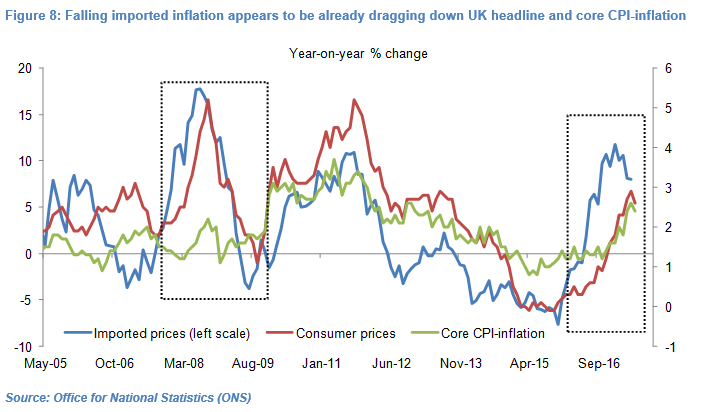 However, unless CPI-inflation and/or GDP growth pick up materially in coming months – which is not my core scenario – the BoE is likely to look through any temporary uptick in inflation and the apparent tightness of the labour market. The ECB may later this year announce a tapering of its Quantitative Easing program and signal potentially higher policy rates in 2018 even if I concur with financial market that rate hikes this year remain a very low probability event. Moreover, I think the ECB, which is strongly influenced by the Bundesbank, will for now refrain from verbally intervening against the Euro. 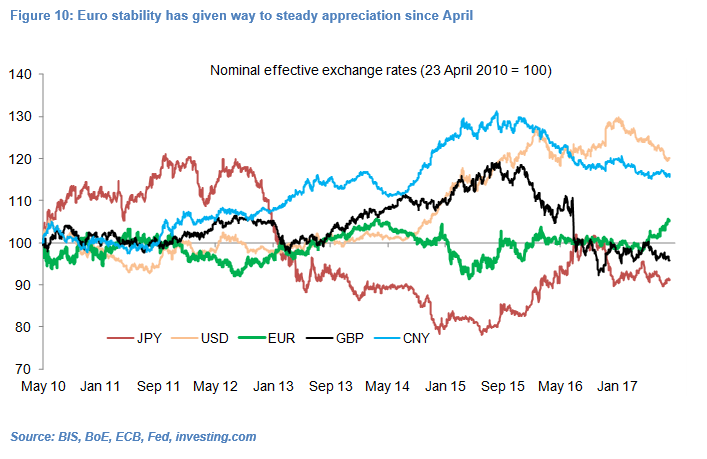 In contrast to the Dollar and Sterling, the Euro – by far the most stable major currency in the past seven years – has appreciated over 7% in NEER terms since early April (see Figure 10). While the ECB may be incentivised to slow the current rapid pace of Euro appreciation, I do not expect it to try and stop, let alone reverse, the Euro’s upward path at this stage (see No UK rate hikes this year and room for further Euro upside, 28 July 2017). For starters, Eurozone growth and labour markets continue to strengthen and the German economy is proving particularly strong. 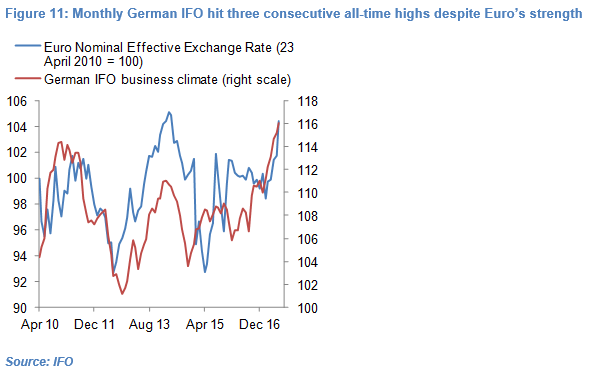 The German IFO business climate index, which is 26 years old, hit three consecutive record highs in June, July and August 2017 (see Figure 11). Of course the Euro’s loss of competitiveness may start negatively impacting Eurozone exports, particularly low-value added goods. But the largest Eurozone economies – Germany, France and Italy – sell about 40% of their exports to other Eurozone countries and thus are arguably more sensitive to regional growth and demand than the Euro’s level per se. Perhaps the most obvious record which financial markets have broken is the continued climb in US equities to new highs and volatility’s fall to near-record lows. The Dow Jones has in the past eight trading sessions set eight consecutive new all-time highs, in the process breaking through 22,000 (see Figure 12). 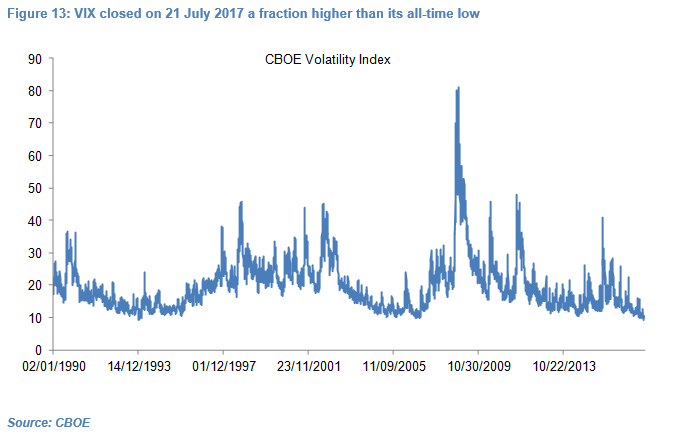 The CBOE’s Volatility index, derived from market expectations of near-term volatility in the S&P 500 Index option prices, closed at 9.36 on 21st July 2017, only marginally higher than the all-time low close of 9.31 on 22nd December 1993 (see Figure 13). Very loose monetary policy in the US – the result of the Dollar’s slide and the US Federal Reserve’s reluctance to hike rates more rapidly – and more globally (see above). The pace of Dollar depreciation, about 4% over the past three months, in itself is close to breaking a multi-year record (see Figure 14). Decent US GDP growth in Q2 and an ongoing, albeit slow, rise in global GDP growth. The US labour market has been a testament to the underlying resilience of the economy but sluggish real wage growth remains a black spot. 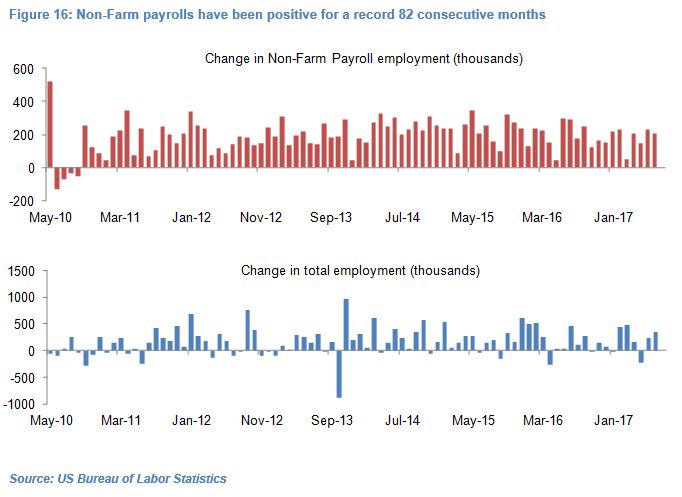 Non-farm payroll (NFP) employment, which excludes farm workers, private household and non-profit organization employees and is derived from the Bureau of Labor Statistics’ Current Employment Statistics survey, has risen for a record 82 consecutive months (see Figure 16). The last time NFP employment fell was in September 2010 and during that seven years period the US economy has created 16.2 million jobs which, to put it in perspective, is equivalent to Ecuador’s population. Broader household employment, derived from the BLS’ Current Population Survey, has been a little patchier and fallen in 20 of the past 82 months. Nevertheless total employment has risen by 14.1 million in that period (see Figure 16), resulting in the US unemployment rate more than halving and hitting a 194-month low of 4.29% in May 2017 (it was 4.27% in March 2001 – see Figure 15). 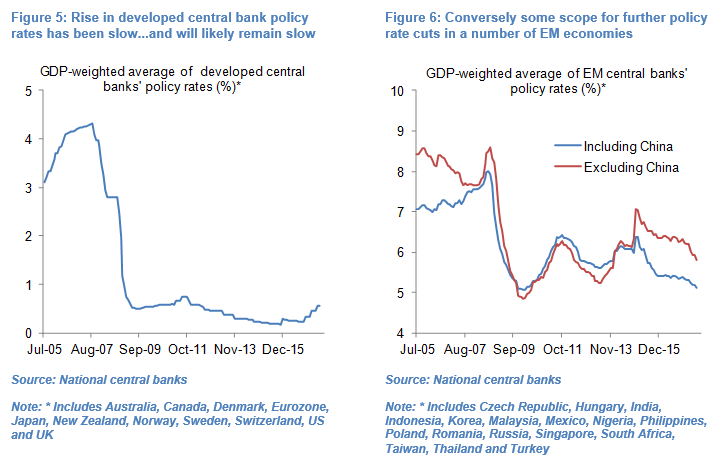 Unlike developed central bank policy rates, emerging market rates continue to edge lower in the face of receding inflationary risks (see Figure 6) and I see room for further rate cuts particularly in Brazil given the pace of Real appreciation (see Figure 17) and to a lesser extent in India. The Central Bank of Russia (CBR) and South African Reserve Bank (SARB) last cut their policy rates on respectively 16th June and 20th July but the Ruble and to a lesser extent the Rand’s depreciation in the past month will likely curtail the scope for further CBR and SARB rate cuts near-term in my view. Asian currencies, which are highlighted in red in Figure 17, continue to broadly tread water in line with my core view that Non-Japan Asian (NJA) central banks have little incentive to materially alter their currencies’ paths (see Asian currencies keeping their head in a world losing its own, 26 May 2017). 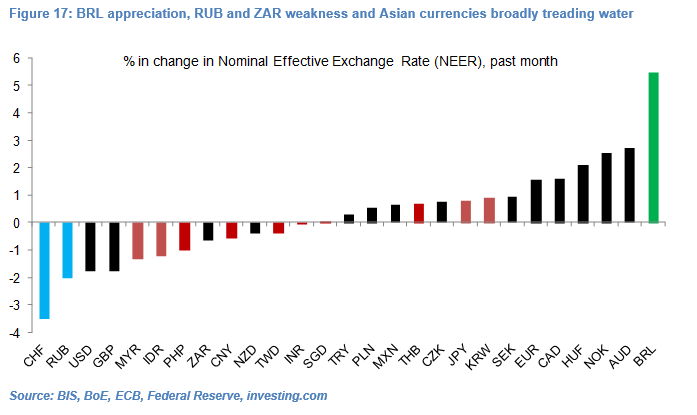 The stability of the Indonesia Rupiah, Philippines Peso, Russian Ruble and Turkish Lira versus the Dollar year-to-date has resulted in emerging market currencies underperforming other risky assets including US equities. 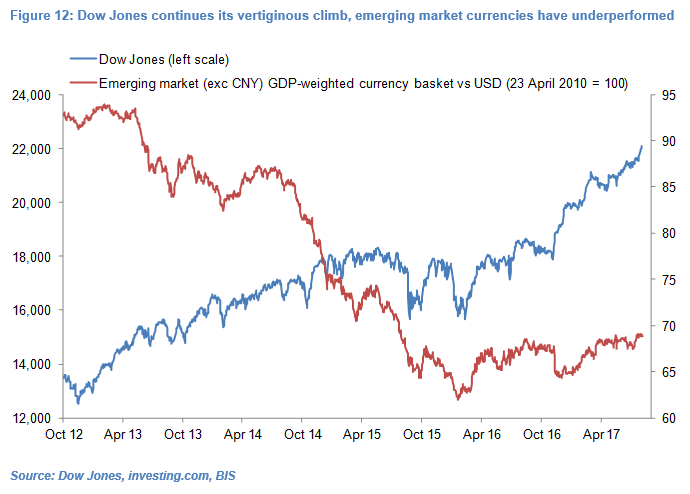 A GDP-weighted basket of EM currencies (excluding the Chinese Renminbi) has appreciated 6% versus the Dollar compared to a 12% rally in the Dow Jones (see Figure 12). 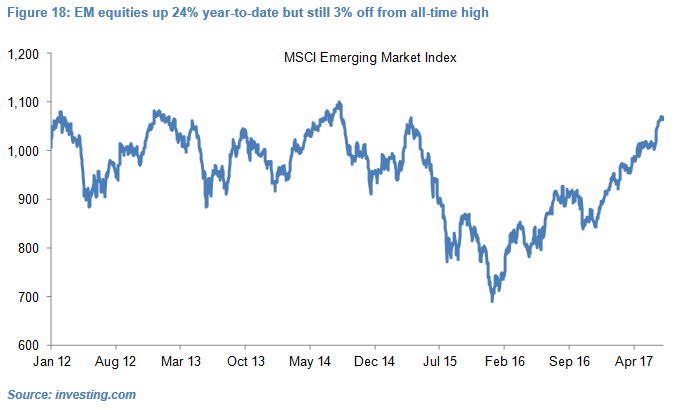 Emerging market equities have outperformed the Dow Jones, rallying 24% year-to-date and 55% since late-January 2016 but are still 3% from the all-time high of 1,101 recorded on 3rd September 2014 (see Figure 18).